And where would you slot the MX70 in this continuum. And, also, the drills are something her mind tells here she should work on, the bumps and trees are where her heart truly calls her. "drills" are not a good thing for trees.......? ? And, also, the drills are something her mind tells here she should work on, the bumps and trees are where her heart truly calls her. Simply stated, I ski PMTS in bumps, trees and drills. Harald teaches a "brushed carve" turn as a preliminary to full locked-edge carve, and, I practice these all the time on green and blue trails. Yes, it's a skidded turn but your skis just come around so quick. His second book title includes "How to ski bumps and powder" but the detailed sections are at the end of the book long after the basics are covered. It's still about tipping movements, having great fore/aft balance and using hand positions and pole planting techniques. Bumps and trees require the skier to BELIEVE that certain body movements will turn the ski. Just one small voice saying it's the skier not the ski. But, as the OP does say EAST COAST SKI, the small voice votes for a 70 ish waist ski. I disagree that a brushed carve is a skid. Peter's definitions for the evaluation of a skis ability to "soft edge" are below.? The smear is the brushed carve, its a lateral movement/sliding of the entire ski whereas to me a skid is primarily a lateral displacement of the tail. Ski tip and tail follow on the same track, but using a lower edge angle which allows some lateral movement across the snow. Effective in deep snow, on steep slopes, in bumps or crud. Facilitates speed management (control) as opposed to maximizing speed, which is what carving does. Out of control turn in which the tails accelerate down the hill faster than the tips and do not follow in the same track. Often results in a fall and usually begins with a wedge turn entry, in which the skis are not parallel. 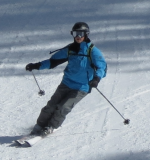 The skier leans back and/or uphill, with most weight on the tails of the uphill ski rather than beneath the arch of the downhill foot. The downhill ski takes off, tail first. One of the leading causes of ACL injury, according to experts. So why does that small voice say 70'ish rather than 66-68'ish.? Just playing devil's advocate here; her current skis for these conditions are 72's and were recommended and sold by Harald and Diana at a camp back in '07 or '08. Lynn, take your new boots to a phenomenal demo day and try some stuff out. Use the info here to create a demo list and have some fun!! I like Snowhots idea. I have wanted to do that myself for some time but have never gotten around to it. It hasn't stopped me from owning some great skis and from buying a few that I wish that I hadn't. It is probably a lot harder for you Lynn living on the east coast, but if you could find one where a bunch of major brands would be featured, it would be a great. If that fails and you make it out to Big Sky again, you can ski my wifes supershapes!! Keep your ears open for East Coast Demo Days for me! Excellent advice. I am in no rush to buy new skis. My current Every Thangs were acquired midway thru winter 2008. Binding issues resulted in Head sending me a new pair for the 2009 season. So overall, these skis are not particularly old, use wise. I have time to leisurely peruse the selection! I like Snowhots idea.? I have wanted to do that myself for some time but have never gotten around to it. It hasn't stopped me from owning some great skis and from buying a few that I wish that I hadn't. It is probably a lot harder for you Lynn living on the east coast, but if you could find one where a bunch of major brands would be featured, it would be a great. I have time to leisurely peruse the selection!? There is usually a demo day at Huntah in mid Dec and one at Elk early Jan IIRC. If I told you the truth behind Living Proof as a log-in, I'd have to kill you! Just kidding! When I first posted on Epic, I had some non-descriptive name that had no meaning. In those days, I visited the Epic instructional forums frequently. PMTS and Harald kept getting bashed by the world, with the exception of a few of his defenders. One day, one of the real genius posters exclaimed that "no-one can learn to ski from a book". I was astounded by this as my skiing had improved so much by reading Expert Skier 2. So the light bulb came on and I changed my Epic handle to Living Proof, with the signature as "Living Proof of the Power of PMTS". A much more meaningful, private reason never revealed before, is that it honors my father as I'm LP of his life. Epic threads would go on forever debating skid vs. brush. I can use either term, but both are not edge lock which is my goal. I have no desire to debate the fine points, but, I concur with your thinking. Sometimes it's just easier to use skid and not have to explain the brush concepts to those unfamiliar with the term used by HH. Actually, 70 ish to me includes getting into the 66-68 realm. I agree with JB's point about the traditional Supershape being an excellent east coast ski for Lynn. 4 mm or so is abut 1/6 of an inch. Big Deal This year's Elk Demo day works for me! Lynn can replace Phil! I've concluded that I know very little about women, and even less about their skis. Time to be quiet! I've concluded that I know very little about women, and even less about their skis. What movie has the above line, followed by a response of but they certainly understand us. ? ? I expect Phil to get this since he seems to have a vast repertoire of movie knowledge in cranial long term storage. And thanks for the response. Both answers are touching albeit in different ways. I'm up for an Elk demo day, by the way.? We were talking about meeting at Elk some weekend anyway, why not on a demo day? And I will say that I too learned tremendously from Expert Skier I.? Not only what the PMTS approach was, but a lot of how that contrasted/contradicted what others had been telling me to do but could never explain.? I think the analysis of skiing in that book matched well with the way I learn (and over analyze). Elk's demo day is very early in January and is on a Friday. In 2011, my guess is that it will be 1/7. That date is on my calendar as it's a good sample of major skis. Head, Fisher, Dynastar, Rossi, K2 are always there. Phil convinced his Kastle bud to attend last year, maybe he can work the same magic even though Phil no longer has a business (read $$$ incentive through sales) relationship with east coast rep.
$20 tickets can be pre-purchased. Not on a weekend?? That sounds even better.? Was it pretty crowded or better than a normal weekend crowd? I'll put it in my calendar and see what Lynn thinks.? Currrently she always has Clinic on Fridays, don't know how that may affect getting Friday off. I would add: skid is widely used by many meaing to drift, slarve, schmear (Phili/ny) but its really just an out of control movement. edgeing is simply and only a matter of the degree of the ski's edges on the snow. 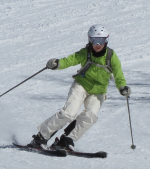 being able to modify the amount of edgin used is a skill and if you can only ski on edge, that is a skill you are lacking as you have limited your ability to regualte speed and turn shape.